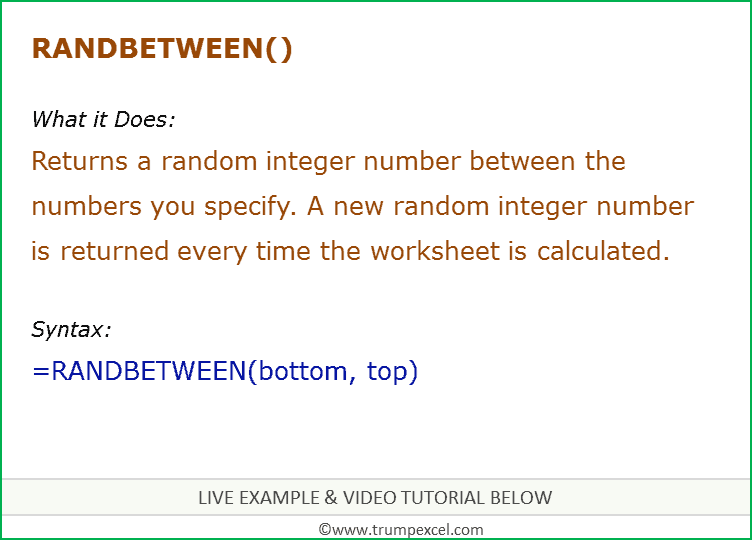 RANDBETWEEN function can be used when you want to generate evenly distributed random numbers between a top and bottom range specified by the user. It returns a number between the top and bottom range specified by the user. bottom – The smallest integer RANDBETWEEN will return. top – The largest integer RANDBETWEEN will return. It recalculates whenever the excel workbook is open or whenever a calculation is triggered in the worksheet. This means that the value of RAND keeps on changing. Since volatile functions re-calculates so often, it adds to the processing time and slow down your workbook. If you want to use RANDBETWEEN to generate a random number but don’t want the numbers to change every time the cell is calculated, you can enter =RANDBETWEEN(bottom, top) in the formula bar, and then press F9 to change the formula to a random number. Generate Unique Random Numbers in Excel. Random Group Generator Template [FREE Download].